Most, if not all, specific questions regarding eminent domain can be found in the CDOT right of way manual. Clicking on “Appraisals” downloads the entire manual, while the “Exhibits” link displays all forms currently in use by CDOT. The general process to developing a partial take report is outlined in the report in Section 1, Purpose of the Appraisal. Following these seven steps will result in a CDOT compliant report. Project location asks for information about the project, not the property. Off-premise signs refer to signs that are owned by sign companies or off-site private businesses and advertise off-premise messages. On-premise signs refer to signs that advertise the businesses located on the property. Site improvements refer to any horizontal improvements, while buildings/structures refer to any vertical improvements. Trade fixtures are articles placed in or attached to rented buildings by a tenant to help carry out the trade or business of the tenant. For example, a tenant's shelves used to display merchandise are trade fixtures and retain the character of personal property, as opposed to all other fixtures that were but are no longer personal property when they are attached to and become part of the real estate. These may require a Specialty Report (see section 3.25 of right of way manual). A fixture is an article that was once personal property, has since been installed or attached to the land or building in a rather permanent manner, and is now regarded as part of the real estate. Damages, Cost to Cure, and Specific Benefits may not be known until section nine is completed. Most of the information asked is the same as for a commercial report. Project description information can often be found on line from the government agency that is sponsoring the project. Anticipated improvements are any improvements other than the current project that will have a positive or negative impact on the subject property. Both grids use the same general procedure as found in the commercial section of Narrative 1. Directly to the right of the comparable sales sheet is the eminent domain comparables sales sheet. Data for the ED sheets is taken directly from the comp sheet to the left. Note that there is significant verification data on the sheet to the right that is not included on the ED comp sheet. Verifying sales is time consuming and therefore valuable to the appraiser. The data is stored in the database, but not shared with the reviewer of general public after the negotiations have been settled. Note that taking in this section denotes the entire parcel that is acquired by the acquiring agency. The term taking is also used in with regard to an easement whereby the owner retains ownership, but some of the property rights have been taken. Always consider the term “taking” or “take” in the context in which it is being used. There must be a $0 in the Value cell for the Owner & Tenants Improvements section. The parcel number generally comes from the survey, legal description, or Project Manager. Enter 0 in the Size (SF) cell if the taking is applicable. The “Reduction in Fee Value” is an estimate by the appraiser indicating the % loss in value of the part being taken due to the loss in property rights, often called the bundle of rights. The values of easements (e.g., permanent, utility, slope, etc.) acquired are shown in this section. The value of an easement is the difference between the full fee simple interest of the land and the remaining encumbered fee interest of the land. Often the value of an easement is based upon a percentage of the full fee value. Include an explanation supporting the use of a percentage of full fee value or other valuation technique. Permanent easements of less than fee title, such as drainage easements, slope easements, utility easements, etc. will be valued by the loss of utility and desirability before and after the imposition of the easement. This loss may be expressed as a percentage of the subject parcel unencumbered fee value. An easement also may involve improvements taken and possible damages and specific benefits to the residue after take. Take care that existing easements within the subject parcel fee acquisition area are properly valued and that double payment is not proposed for easement replacement. The value of the temporary easement is based on the annual interest rate of the land, the length of time the temporary easement will be needed, and the value of the land in $/SF. The length of time the temporary easement will be needed is established by the agency or Project Manager, not the appraiser. The interest rate is generally market driven and can be determined by looking at similar eminent domain reports in the public domain and seeing what interest rates were used. Residue, at times called the remainder, is property retained by the owner and is not taken or acquired. Analysis of the residue’s value is critical and required for estimating compensation for damages and/or specific benefits. The “take” or “taking” referred to in this section is the portion of the land that is impacted by the easement (permanent, slope, special, etc). It does not include the full fee take, if any, that was acquired by the agency, not does it include the temporary easement, if any. The owner and tenant improvements include both the vertical and horizontal improvements. The rental analysis is used to ascertain whether or not surrounding properties will see an increase or decrease in rental rates. If the HBU changes significantly to the point that the land value ($/SF) is different than the larger parcel ($/SF), the complex partial take report may be needed. If this situation occurs, the appraiser should consider calling the CDOT Region for their area and getting an opinion. Damages and Cost to Cure can are estimate in the worksheets beginning in cell H16. The costs are then transferred to the main table. Damages are unique to each property and there is no “one size fits all” approach to determining them. Be aware that there cannot be any cost to cure without damages. This worksheet summarizes that compensation to the landowner based on the various takings, damages, benefits, and cures. This worksheet is for the appraiser and is not included in the final report. The remaining CDOT worksheets are calculated from the values that are entered in the above data sheets. Each eminent domain appraisal is unique as are the valuation, compensation, damages, benefits, and cures. It is incumbent on each appraiser to carefully read the final report to look for consistency and logic in determining the final compensation. Note that changing a value in a worksheet in the final report does not change other worksheet values. Creating collages for comparable sale sheets. Download and install Photoscape. This is a free software program that allows you to edit photos and create a collage. Before opening the program, create a directory on your C: drive titled “N1 Images”. All photos including camera pictures, edited photos and collages will be stored here. Organize your photos in any way that is convenient for you. N1 suggests that you start out by making a folder for each comp and saving your camera images and aerial (plat) images to the appropriate folder. The objective of the collage is to create one image that contains two side by side images. Each image is 475 pixels wide by 420 pixels high with a 2 pixel border separating the pictures. These images are then combined into a single image called a collage. The street view photo will be on the left and the aerial (plat) image will be on the right. Clicking on the Help icon ( ) will bring a complete help section with a short video on each major area in Photoscape. After installation, open up Photoscape and select “Editor” ( ). Navigate to the “N1 Images” folder and select an image. On the toolbar below the image select the “Crop” tab. 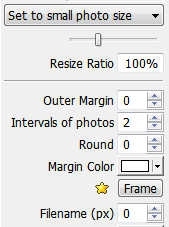 From the pull down menu, select “Assign Ratio/Size”. Enter 475 for the height and 425 for the width. Click OK. Drag the handles to get the correct size of the window. Clicking in the middle of the size box allows you to position the size box anywhere in the photo. When the size box is correct, select “Save Cropped Area” and save it to the correct folder in “N1 Images” folder. Rename the image with the word “cropped” in the beginning of the file name so it is easy to locate. If you saved an aerial (plat) image, repeat the process for it as well. Select the “Combine” tab ( ) from the menu strip or the opening page. To set up the combine operation, click on the “Side” tab ( ). This will position the pictures side by side rather than on top of each other. Navigate to the your “N1 Images” folder and select the folder with one of the images you want to use. Drag the aerial map (right side image) thumbnail in the lower left pane onto the large canvas area. To match the Excel spreadsheet, the street view picture should be on the left and the aerial (plat) map should be on the right. If the images are reversed, you can swap them by dragging of the images in the very top title bar to a different position. Save the collage by selecting the “Save” button in the upper right control box. To create a new collage, right click on an image in the top title bar and select delete. When both images have deleted, repeat the above sequence to create the next collage. Elect “Manage Comps” from the sale grid template. Select the comp you want to add the image to in the lower pane. Click on the “Img” ( ) button on the right. Navigate to the collage that was created in PhotoScape and select it. A message box will be displayed after the database has imported the image. Go the comp in the sales grid that you want to add the image to. Click on the “Insert Image” ( ) button and the image will be placed near the image box. Use the handles to resize the image to fit into the image box.